Only 3% of the islands can be visited. Located 600 miles away from the Ecuadorian coast and regrouping more than 125 islands, the Galápagos are considered a unique and delicate place on earth, home to over 1900 species of plants and animals that can’t be found anywhere else in the world. Only 3% of the islands can be visited, although all of them remain under strict regulations in order to protect the rich flora and fauna that has been part of them for centuries. Founded in 1959, the Charles Darwin Foundation primary objectives are to ensure the conservation of the unique Galápagos ecosystems and promote the scientific studies necessary to fulfill its conservation functions. The same year, the Ecuadorian government declared 97.5% of the archipelago's land area a National Park. 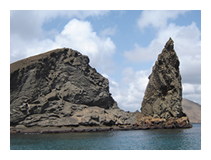 Introduced plants and animals, such as feral goats, cats, and cattle, brought accidentally or willingly to the islands by humans, represent the main threat to the Galápagos. For that purpose, any traveler will have to respect and follow the Galapagos National Park Rules to ensure the conservation of these enchanted islands. We invite you to learn more about these magnificent islands and how you can contribute to their protection in the following sections.